This elegant 4 bedroom apartment with rooms for rent offers an area of 85 m². The apartment takes full advantage of each square meter with 2 bathrooms and offers a spacious common area, with the living room being connected to the dining room and kitchen. This property is completely renovated for comfort and the bright colors of the walls add for an even cozier atmosphere. Located in the middle class neighborhood of L’Eixample Esquerra, the apartment is near the Universitat Politècnica de Catalunya campus. 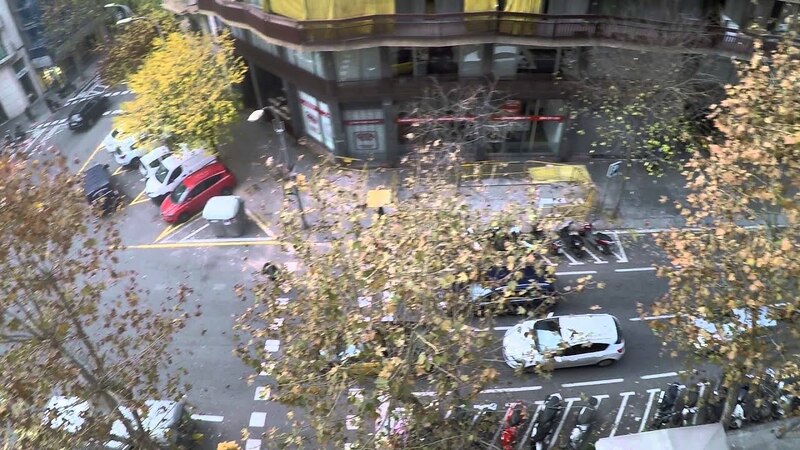 Due to its close proximity to Barcelona´s university campuses it is a very young and vibrant neighborhood. The apartment appears to be in a traditional building, but is fully renovated. The apartment is equipped with wooden floors. In addition to the nice flooring, the kitchen and living room have modern amenities such as a washing machine, an electric stove, an oven, and a TV. The proximity to public transport and university campuses make it a convenient and central location for students. Bedroom 2 has the privilege of having its own balcony. Only 2 bedrooms have street views. The room order given in the video is incorrect. Please see below and review the floor plan for the correct layout. This apartment is conveniently located between two line 5 metro stops: Hospital Clínic and Entença. It is also a short walking distance away from the Francesc Macià tram stop which provides access to lines T1, T2, and T3.